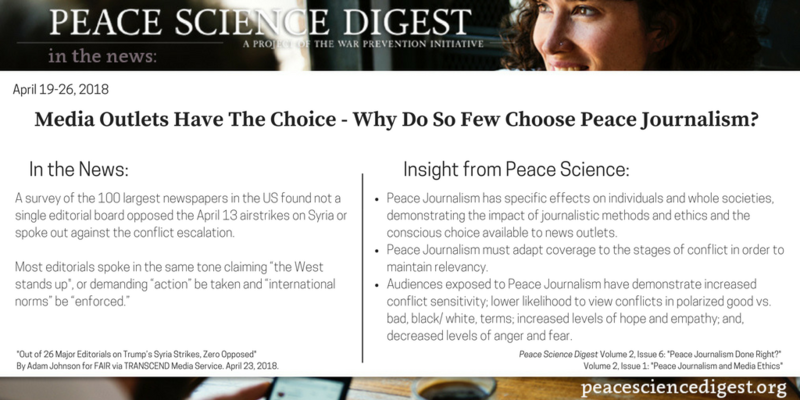 Media Outlets Have A Choice – Why Do So Few Choose Peace Journalism? In a survey of the 100 largest newspapers in the US, not a single editorial board opposed the recent airstrikes on Syria. Of the top ten papers, seven openly supported the airstrikes. The professional and ethical standards of Peace Journalism provide a clear path toward better reporting and a more informed audience. Peace journalism must adapt coverage to the stages of conflict in order to be relevant. Peace journalism can have long-term effects through consistent peace framing. Peace journalists need to avoid discrediting themselves by being drawn into the conflict, taking positions, or propagating conflict strategies. “Out of 26 Major Editorials on Trump’s Syria Strikes, Zero Opposed”. By Adam Johnson for FAIR via TRANSCEND Media Service. April 23, 2018. Next article Can Intergovernmental Organizations Help Prevent Civil War?